New preliminary data released this week by the International Energy Agency (IEA) demonstrates how natural gas has enabled the United States to lead the way in reducing global energy-related CO2 emissions, which are the largest source of man-made greenhouse gas emissions. 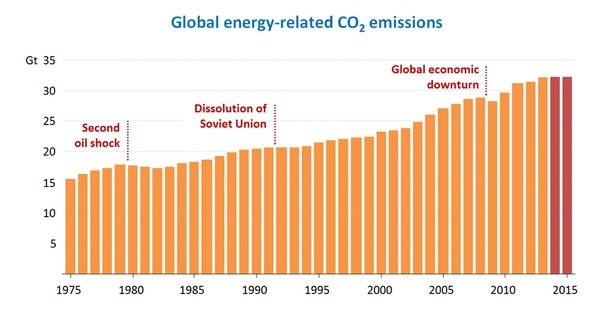 Global emissions of energy-related carbon dioxide stood at 32.1 billion tonnes in 2015 and have remained essentially flat since 2013, according to the following IEA graphic. This IEA graphic shows how energy-related CO2 emissions have remained stable the past two years. Recent Energy Information Administration (EIA) data confirms IEA’s assessment that the U.S.’s increased natural gas use led to energy-sector CO2 declines in 2015. 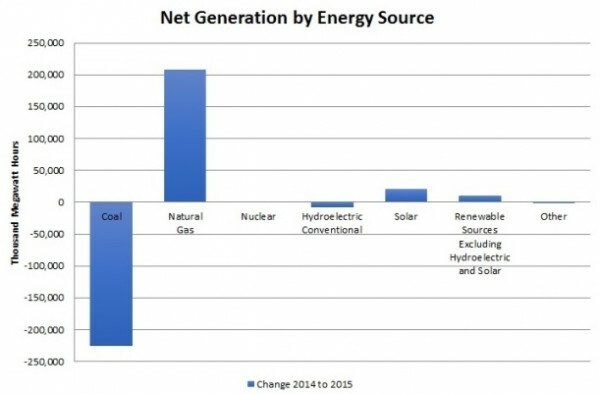 As the following EIA graphic shows, natural gas far outpaced growth from other fuel sources used for electrical generation in 2015, becoming the leading source of U.S. electricity for the first time in April 2015 in addition to being the top U.S electrical generation fuel in each of the last six months of 2015. This EIA graphic shows how use of natural gas for electricity generation increased dramatically in 2015. EIA also announced this week that for the first time natural gas is expected to be the top fuel used for electrical generation in 2016, as the following graphic illustrates. IEA’s new data further confirms several other recent reports crediting U.S. shale gas for contributing to a decline energy-sector carbon emissions. • According to the EIA, the burning of natural gas in the U.S. since 2005 has prevented 1 billion metric tons of CO2 from being emitted into the atmosphere. Use of renewables has prevented 600 million metric tons of CO2 emissions in the same timeframe. • Similarly, The Breakthrough Institute (BTI) – an environmental group founded by individuals whom Time Magazine recognized as “heroes of the environment” – released a report in 2013 that demonstrated that natural gas has prevented 17 times more carbon dioxide emissions than wind, solar, and geothermal combined. 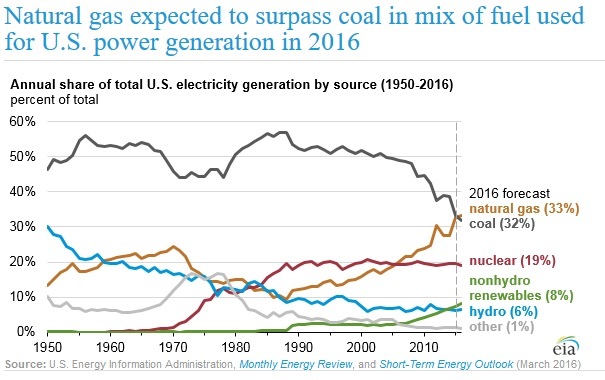 • This EIA also reported last year the increased use of affordable natural gas made possible by the shale gas revolution helped lower U.S. CO2 emissions from the electricity generation sector to 27-year lows in April 2015. Not coincidentally, natural-gas fired electrical generation has seen a 438,478 megawatt hour (48 percent) increase since 2007. • And a recent report by the Manhattan Institute also shows that natural gas is responsible for nearly 20 percent of total carbon dioxide emission cuts from 2007 to 2013 and that for every ton of CO2 emission reductions attributable to solar power, 13 tons can be attributed to natural gas.